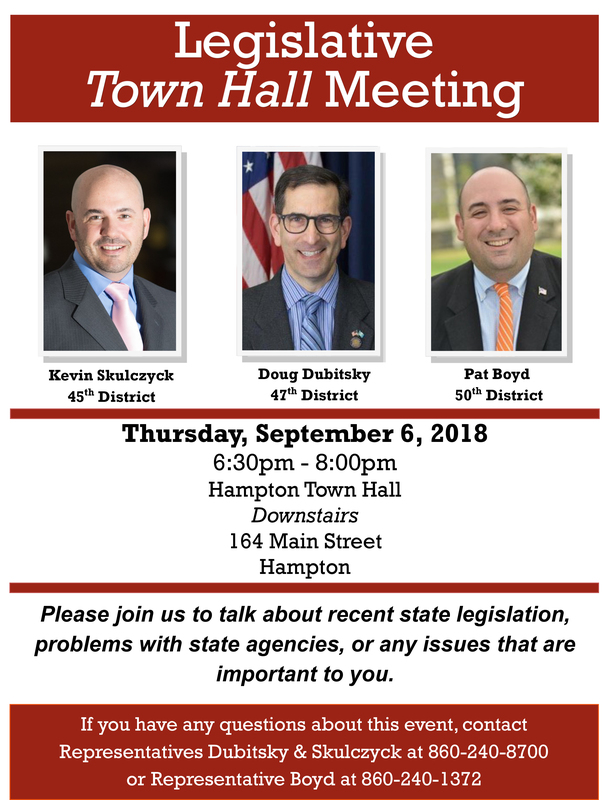 HARTFORD – State Representatives Doug Dubitsky (R-47), Kevin Skulczyck (R-45) and Pat Boyd (D-50) will be co-hosting a Legislative Town Hall Meeting at the Hampton Town Hall on Thursday, September 6th, 2018. The representatives will discuss issues addressed during the 2018 legislative session along with any state-wide issues that are important to the residents of Hampton and the surrounding region. WHEN: Thursday, September 6th, 2018 from 6:30 to 8:00 p.m. These events are free of charge and open to the public. If you have any questions, or are unable to attend but would still like to connect with Representative Dubitsky or Rep. Skulczyck, please call 1-800-842-1423 or email them at Doug.Dubitsky@housegop.ct.gov or Kevin.Skulczyck@housegop.ct.gov. For Rep. Boyd call (800) 842-8267 or email him at Pat.Boyd@cga.ct.gov. Please check your representative’s website for any cancellations prior to the scheduled meeting date.